Our very first issue has hit the stands! 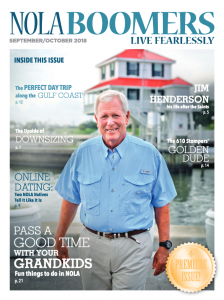 Nola Boomers is a new bi-monthly magazine committed to giving up-to-date knowledge, resources, and advice to boomers and beyond (and before!) in the Greater New Orleans area. We aim to enthrall our readers with the best interviews, most informative articles, and biggest events happening in and around New Orleans. Nola Boomers targets active, interested adults ages +, engaging their interests in arts and entertainment, food and drink, home, travel and recreation, history and nostalgia, health and fitness, and finances. We deliver fresh and relevant information while recognizing our readers' need to connect with their families. Whether it is how to stay connected with your children, grandchildren, or finding the best way to care-give for aging parents, Nola Boomers has the answers. Nola Boomers will be a full color, glossy, bi-monthly magazine with approx. 300 distribution points throughout the greater New Orleans area. Has a distribution place you would like to see us? Let us know today! For more information, or if you're interested in advertising in Nola Boomers Magazine, please email us at [email protected]. Are you a baby boomer and beyond and are an experienced writer interested in writing for Nola Boomers? Please send your clips and writing samples to [email protected].